I have been working so hard on a few different designs to add to my collection. For the last few weeks I have been sketching owls. However, I have gotten frustrated with them, so I put them aside for the time being. When I get frustrated with a project I usually go back to something I really like doing. I absolutely love garden scenes, garden stuff...well, I just love gardening. Since it is the season of love my mind has been wandering in that direction. This is not my favorite season, but since it is here, why not create something that I love. It amazing how my doodling in church led to my present design... For those of you who attend church with me, Yes, I do listen during the sermon! I just DRAW while I listen! I have a photo above of my sketch on the back of my bulletin. I will post another picture of the finished product. I will add these to my notecards and placemat selections for those of you who like it. I have been so excited about working with my new Copic markers. After reading Mary Engelbreit's blog on Old Dog, New Tricks, I decided that I just had to have some. Most of my drawings are done in marker and Prismacolor pencils. I have never used the Copic brand, but let me tell you, they are awesome...You will have to read more on her blog about them, because she is the expert artist! Hopefully, this dreadful cold weather will be leaving us soon. I find that I have more inspiration during the warmer months of the year. 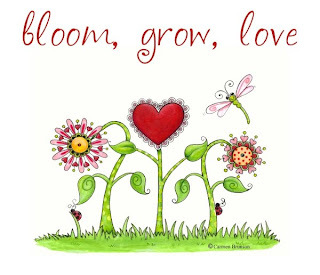 So bloom, grow and love where you are planted! Until next time....Carmen b.